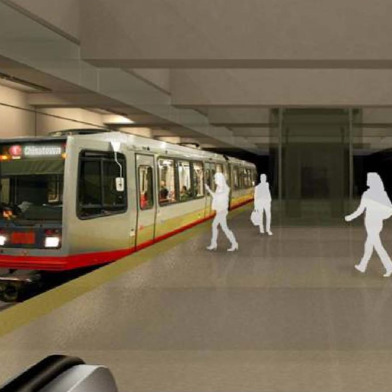 A civil grand jury report calling for the overhaul of San Francisco’s Central Subway project will be a topic of discussion at a Board of Supervisors committee meeting on Thursday. The San Francisco Civil Grand Jury report released in July criticized the $1.6 billion project, calling it “breathtakingly expensive” and inefficiently designed. The Central Subway, which will create a new branch of the San Francisco Municipal Railway’s T-Third light-rail line, is designed to run north along Fourth Street from Brannan Street before going underground at Interstate Highway 80, with subway stops at Moscone Center, Union Square and Chinatown. The board’s Government Audit and Oversight Committee will discuss the report and craft a resolution in response to it. San Francisco interim Mayor Ed Lee and the San Francisco Municipal Transportation Agency have written official responses to the report in defense of the Central Subway, saying it will improve the commute of underserved communities in the city and is being mostly funded by the federal and state governments. “Save Muni,” a group of public transit advocates, will attend Thursday’s committee meeting to “ask (the board) to acknowledge the validity of the grand jury report,” said Jerry Cauthen, a founder of the group. Cauthen said the mayor and agency’s responses were “extremely weak” and said his group is asking for more in-depth responses from the city before it moves forward with the project. The project, which is expected to be operational in 2019, has become a hot-button issue in the November mayor’s race, with City Attorney and mayoral candidate Dennis Herrera coming out in opposition to it, while Lee and other candidates have supported it.